James Turk & John Rubino: Crack Up Boom Has Started - Wall St. for Main St.Wall St. for Main St.
Jason Burack of Wall St for Main St had on a special treat, co-authors of The Money Bubble, James Turk founder of Gold Money http://www.goldmoney.com/ and returning guest and former Wall St analyst, John Rubino http://dollarcollapse.com/ for this in depth, 40+ minute round table discussion. 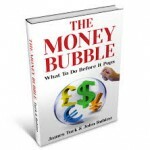 James Turk and John Rubino also co-authored Dollar Collapse, which was written before the financial crisis of 2008 and it predicted banks and home prices would collapse. The book is also available on Amazon as an eBook or a regular hard cover. This in depth discussion talks about currency swaps and their more frequent use and why they are being used more frequently, financial history, manipulating interest rates by global central banks who want to maintain financial repression, currency wars, inflation, deflation, asset price inflation and gold!